Dr. Rock's Blog & Roll: Album of the Day: Yes (1/4/72) 38 Years! 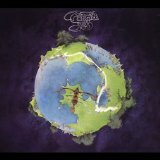 Album of the Day: Yes (1/4/72) 38 Years! Yes released their fourth album, Fragile on January 4, 1972, a scant six months after Rick Wakeman left the Strawbs and joined Yes (click here for my playlist), bringing synthesizers and another strong classical music background to a band on verge of breakthrough. While contractual issues precluded any official credit for his keyboard and co-writing work on the album, Wakeman’s presence solidified the band, their sound and their place in rock history. Fragile quickly rose to #4 on the Billboard 200 and pushed the band to the forefront of the burgeoning prog-rock movement. The whole affair owes everything to the surprise hit single version of the 8-plus minute “Roundabout,” which became a cross-over AM and heavy FM hit after a shortened version was released as a single. That extremely unusual achievement lifted an otherwise excellent prog-rock album to unheard of heights and began a nearly 40 year reign for Yes as the quintessential and longest-running prog-rock show on Earth. Surprisingly, Fragile is not on Rolling Stone magazine’s Top 500 Greatest Albums of all time, but it should be in the first 100. However, it is available as a CD on Amazon (click here) and download tracks on iTunes (click here).